Exposure to flour dust may induce chronic respiratory manifestations as well as acute ventilatory effects. 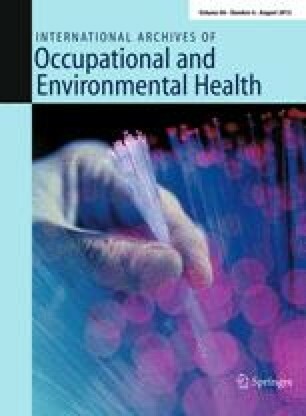 We compared the prevalence of respiratory symptoms, ventilatory impairment, and variations in pulmonary function over the workshift in a group of mill workers exposed to wheat flour and in referent workers. One hundred and forty-two men exposed to flour in a mill and 37 referent workers were included in this study. Each subject completed a standardized questionnaire. Pulmonary function tests were performed before and after the workshift. The assessment of environmental exposure to flour showed high concentrations during some jobs with a high percentage of inhalable particles and a low concentration of respirable particles. The exposed workers had a significantly higher prevalence of usual cough and usual phlegm than the referents. The prevalence of asthma, based on the questionnaire, was similar. Before the workshift, the exposed workers had significantly lower mean lung function values for peak flow rate and forced expiratory flow rate at 75% of the vital capacity than the referents. After the workshift, all the lung function values showed a slight decrease, significant for forced vital capacity and forced expiratory volume during 1 s in both groups. Among the exposed workers, the asthmatic subjects had a significantly higher decrease across the shift than the nonasthmatic workers. This result is probably linked to bronchial hyperreactivity. Among nonasthmatic subjects, the decrease was larger in nonexposed workers than in exposed workers. A higher prevalence of respiratory symptoms and lower pulmonary function values were observed among mill workers by comparison with referents. Moreover, the data suggest that asthmatic status and the time of spirometric measurements need to be taken into account in epidemiological studies on exposure to airborne allergens. In addition, the study does not exclude a healthy worker effect with selection of dust-resistant subjects or better identification of asthmatic subjects among the workers exposed to an allergenic substance than among the nonexposed workers.